The amount of sugar we (and our children) consume has been a hot topic for years, but this week we reached a crucial point in the debate following the publication of new recommendations by the Scientific Advisory Committee on Nutrition (SACN) - the first wide ranging look at the relationship between sugar consumption and health outcomes in the UK since the 1990s. The Government has accepted the recommendations, which means official advice on the best diet for health will change. In this blog, PHE’s National Director for Health and Wellbeing, Kevin Fenton, and Chief Nutritionist Alison Tedstone answer questions about the new recommendations. Can you first explain what SACN is and why their recommendations matter? What have SACN said about sugar in their new report? AT: “They advised the Government to halve the recommended intake of free sugars to no more than 5% of our daily energy intake. In more everyday terms, SACN have said that adults (and children over 11) should be consuming no more than 30 grams (7 cubes) of sugar each day. 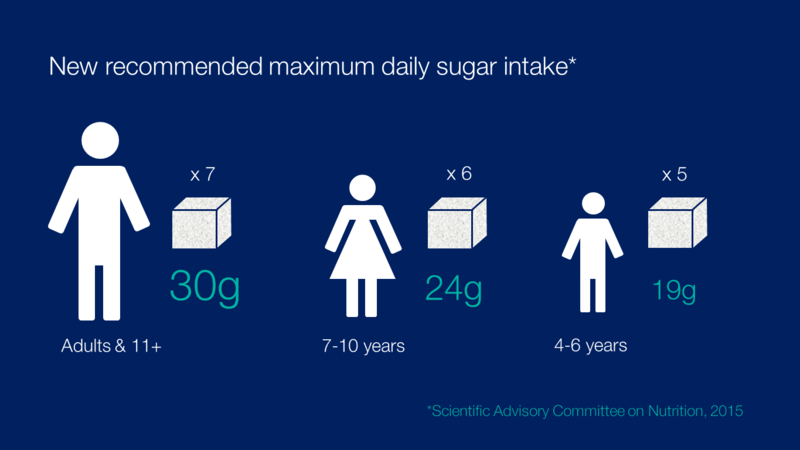 Children from 7-10 should consume no more than 24g (6 cubes) and finally a 19g maximum for children from 4-6 (5 cubes). What’s the point in having a daily level – why 5% of energy intake? Most people understand that it’s best to avoid too much sugary food and drink but can you elaborate on why people need to cut down? KF: “It is now widely acknowledged that we have an obesity and diabetes crisis which is presenting us with two very serious problems. On an individual level we’re damaging our health. Too much sugar means too many calories which leads to weight gain. This all adds up to increased risk of obesity and very serious illnesses such as type 2 diabetes, heart disease and some cancers. Which groups of people need to cut down on sugar? AT: “A recent national survey confirmed that we are all eating too much. 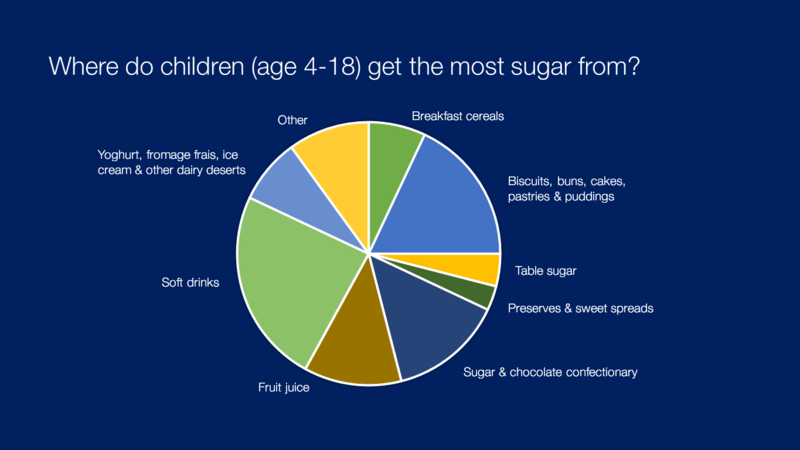 Adults are eating more than double the new recommended amount and teenagers are consuming three times more sugar than the new recommendations. 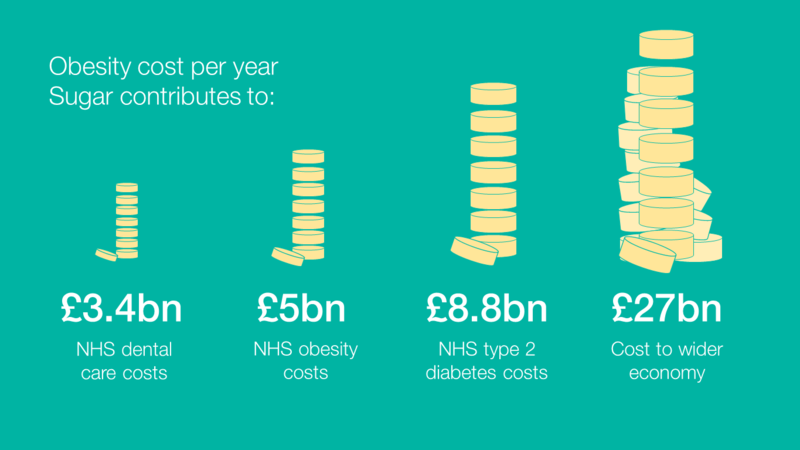 This has to change as on current trends one in three people will be obese by 2034. Already more than a fifth of 4-5 year olds are overweight or obese and this rises to a third of 10-11 year olds. There’s a lot of diet and health advice out there – what can people do immediately to cut their sugar intake? AT: “Sugary drinks are a major culprit and we’re particularly urging parents to cut them from their children’s daily diet. SACN have identified that their consumption leads to excess energy intake and weight gain and a can of fizzy drink can contain more than 30g of added sugar – that’s 7 cubes. If families buy sugary drinks then simply swapping them for water, low fat milk or diet drinks will make a big difference. Our Change4Life campaign provides a range of easy to follow advice on how to make healthy diet choices. Messages used by the Change4Life campaign and advice on the NHS Choices website will change to reflect new SACN recommendations and we are also refreshing the eatwell plate to help people better understand all current and new dietary advice." Apart from simply making better food choices, what else can we do to reduce sugar consumption? KF: “Nobody will be surprised to hear that there’s no single solution – individual action is just one piece of the jigsaw. We’re finalising a review of the wider factors that influence our sugar intake. These include marketing and promotions, the amount of sugar added to the products we buy and fiscal measures. How can local authorities help to reduce sugar consumption? KF: “They can improve the food and drinks on offer in public buildings and spaces and identify opportunities to build this into contracts with local authority venues such as leisure centres, parks and swimming pools. They can also implement government buying standards for food and catering services, which incorporate nutrient criteria and they can support local food businesses, such as takeaways, to promote healthier eating through training as well as incentives and reward schemes. AT: “SACN’s report is available online along with a briefing on the science behind the 5% recommendation. Our Change 4 Life campaign has lots of tips and advice and you’ll be hearing much more from Change 4 Life on sugar in the autumn. I agree that it is important to target parents with regard to a child's consumption of sugary drinks, but let's not forget that children are also influenced by the behaviour of their parents. Every time I go into a supermarket I see people loading up their trolley with multi-packs of beer etc. I also think that targeting young adults is another important consideration - I was shocked recently when I went to my local Weatherspoon's for a drink, to see young women sat with a whole jug of pimms and lemonade to themselves and drinking it through a straw - apparently this is quite normal! Perhaps the department of health should also be looking at how sugary/alcoholic drinks are sold these days. The problem is that many people ignore all the warnings until it's too late. The sugar emblem on packaging should be a pic of a teaspoon of sugar x 'n' amount of sugar in the item/package ... actually seeing a teaspoon of sugar makes it much easier than % of content for added sugar and, perhaps, an apple image for naturally occurring sugars then, like the pics of glasses on alcohol products, that becomes a standard amount - or like the warning on cigarette packets : THE CONTENT OF THIS PACKAGES CONTAINS 'N' TEASPOONS OF ADDED SUGAR AND CAN SERIOUSLY DAMAGE YOUR HEALTH' ... it is scary just how much 1gram of sugar actually is ... and just like with smoking and drinking there is consumer choice were it can then be said that you now know what you are doing to yourself [and your family] . I don't think the use of 'cubes' of sugar is helpful ... it is a long time since people used cubes of sugar in their tea and coffee. The imagery HAS to be modern, relevant and simple to use and the under 40's are definitely more used to checking packages for dietary information ... make the most of that. Education and clear labelling are key as are parental choices. The sugar spoon symbol is one that cannot be misunderstood - but it scares the manufacturers of such products, and they have the money to lobby. If we take into account that the groups who "indulge" in "recreational drugs" ALL suffer from "the munchies" then you can see the root of the problem without the rosey glasses. It seems that to "have fun" you have to binge drink or indulge in the above. What will they crave after a "session" ? I agree with Elizabeth the government should force manufacturers to clearly specify the amount of sugar in their product; currently showing % does not make it clear to every member of the public. It would be better for all if every manufacturer had to clearly specify natural sugar, added sugar and total sugar in grams or as Elizabeth suggested in teaspoons. Sugar is toxic. If they have to put warnings on cigarettes, drugs, etc then it applies to sugar - possibly more so as most people still think that honey is healthy when it is pure sugar.